What qualifications are required to be an expert travel consultant? A 2-year program, sponsored by the Cruise Line Industry Association (CLIA), equivalent to an MBA in the cruise industry. Having grown up in Puerto Rico, I am fluent in Spanish and have traveled to many of the Caribbean islands. My husband and I lived in southern Spain for 3 years and took every opportunity to travel throughout Europe. We’ve been to 80+ countries…and counting. I began my career by graduating with a BA in Psychology from Monmouth University in New Jersey. What are your favorite places and activities? Where have you traveled most recently and where are you going next? 1. 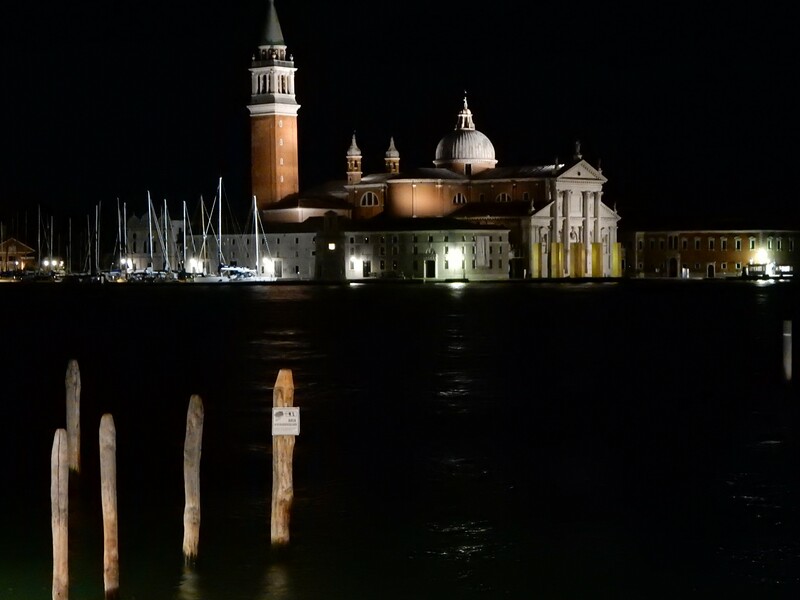 Italy, Italy, Italy !! We definitely need an Italian infusion. Our plans are to spend the month of October revisiting Italian people, places and things we love, plus venturing into regions, cities, towns, and villages on our ‘must get there someday’ list. We are still finalizing the exact itinerary, so here is what we plan to do so far: Rome, Florence, Tuscany, Umbria, maybe Puglia, Naples & Amalfi Coast and maybe Sicily. 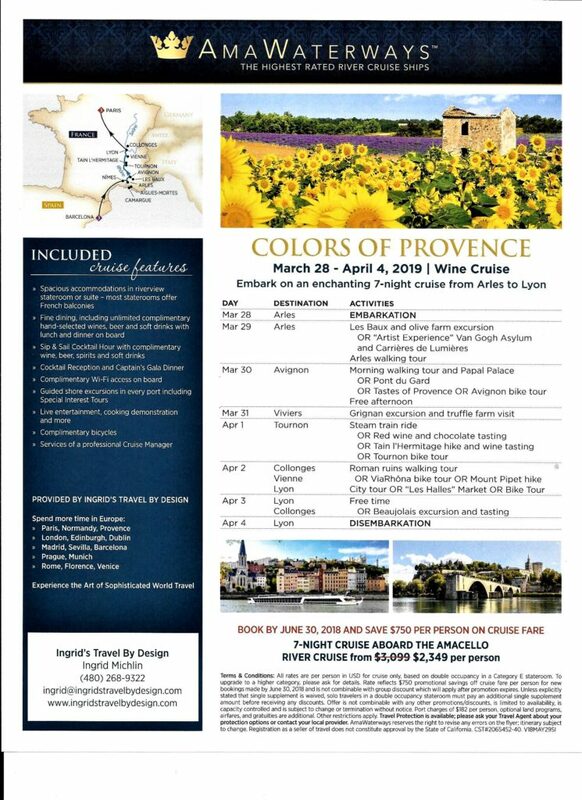 2 – Late March – early April – We have blocked a number of cabins on an AMAWaterways Rhone River, wine-themed Cruise (The colors of Provence), Arles to Lyon, France. The itinerary goes through some of the most storied wine regions of France. Can you say: Chateau neuf de Pape? Lee and I will be on this cruise and will be sharing our knowledge of the region along with the USA, husband & wife winery owners and the AMAWaterways staff. Most tours are included along with all meals and Chef’s table. Beer and wine are included with lunch and dinner. Space is limited and cabins are selling fast. Pay $400 (per person) by June 30, 2018 to reserve your cabin and save $750 (per person) off published rate. Why shouldn't I use an online site to book my trip? In the age of online booking sites (On-Line Travel Agencies [OTA]), using a travel agent may feel like going the way of the dinosaur. But agents are more useful than simply selling trips to Disney World and cruises. Many agents still provide services or have knowledge that you just can’t get online –and sometimes, especially in times of crisis, working with a real live person is just plain superior. Instead of searching blindly on the Internet for hours, days, or even weeks – depending on the complexity of the travel plans – you can have an expert do the research for you, with your personal needs in mind. They do it for every component of the trip. 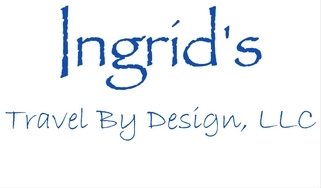 “Ingrid’s Travel by Design is the best! The personal touch Ingrid puts in her work is top-notch! Everything is organized and planned up to the smallest detail. From special access to venues, to personalized tours, and beautifully presented travel documents and itineraries, Ingrid makes you feel special and helps make any trip an exceptional one. She puts her extensive knowledge on international travel and her own personal experiences to good use and when she recommends a hotel, a restaurant or a tour, you can be sure that it will be the best of the best. She made my first international travel experience a memorable one. Everything went smoothly and we had the best time ever. When you travel, with Ingrid’s Travel by Design, you can be sure that you will have the time of your life.